This American invention is somewhere between a sweet, fat pancake and a Yorkshire pudding. Our recipe makes one but it can easily be doubled and cooked in a larger, 25cm pan. 1. In a bowl, mix 65g plain fl our with 2 tsp caster sugar, a large pinch ground cinnamon, the zest of 1 lemon and a small pinch of salt. 2. Make a well in the centre and whisk in 2 eggs and 110ml whole milk to a smooth batter. Cover and set aside to rest for at least 20 minutes, or chill for up to 24 hours (the longer the better). 3. When ready to cook, preheat the oven to its highest setting. 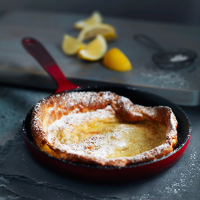 Melt ½ tbsp unsalted butter in a 20cm ovenproof frying pan, until hot and foaming, swirling it all over the base. 4. Stir the batter and pour it into the hot pan. Put it in the oven and reduce the temperature to 220˚C, gas mark 7. Bake for 10-15 minutes, until set, puffed and golden. Dust over icing sugar and serve with lemon wedges.